There will be no Premier League clashes on Christmas Eve after all. DECEMBER’S PREMIER LEAGUE clash between Arsenal and Liverpool will not be scheduled for Christmas Eve after an angry backlash from Reds fans. With Christmas Eve falling on a Sunday this year, Sky TV had proposed the clash – which is to be hosted at the Emirates – should be held then, much the same as many other top-flight clashes in the English top flight. Back in September, Jurgen Klopp voice bemoaned the prospect, suggesting that, sometimes, there are more important things than football. Fans were furious about Sky’s plan, however, due to being faced with the prospect of getting stuck in London for Christmas Day. Separately, reports claim that Arsenal would have had issues hiring a sufficient amount of stewards for the high-profile match up. 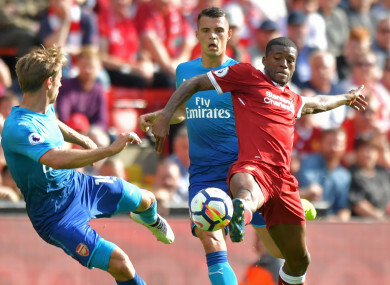 Instead, the Reds will travel to face the Gunners on Friday, 22 December, leaving Arsenal looking like they will have two weekday matches if they successfully negotiate their way past Norwich City in the Carabao Cup next Tuesday, with the quarter finals set to be played on December 19 or 20. In the last few minutes, Sky have announced that Christmas Eve will be kept free, following talk that they would move a different Premier League clash to 24 December. - This article was updated when it was announced that no Premier League fixtures would be played on Christmas eve. Email “Arsenal-Liverpool fixture won't be played on Christmas Eve after backlash from fans”. Feedback on “Arsenal-Liverpool fixture won't be played on Christmas Eve after backlash from fans”.